This issue of TXP Magazine delivers more exciting firsts. Ralitza brings us the first Site Watch article, profiling 24 Ways and the key fellow behind it, Drew McLellan. Kevin delivers the first full-length tutorial on creating a front-side extranet. Philipp Schilling, one of two new team members, takes time to consider Textpattern’s brand strategy in the longer run. Stef describes several custom developments in the magazine that many of you have been asking about. For you freelancers who’ve ever wanted to work and truly be free, Marie shares how it can be done from a bungalow in Bali. And Claire Brione, plugin developer extraordinaire, is profiled in the calms of Vendeuvre. All that and more. Nothing to be missed. Here we are, three months and four days later with another glorious issue of TXP Magazine. My title says a lot about the last three months, because it’s exactly how we’ve been approaching every decision made, and every action taken—with single measured steps. Before I dive in, I’d like to make something clear to the world. It takes a lot of time and effort to create each issue of this magazine. If you’re in the publishing business, you know what I mean. None of it would be possible without the amazing folks on the editorial team. Each one delivers despite already having their hands full with day jobs, the trials and tribulations of domestic life, other community commitments… you see what I mean. I even see their writing abilities improve with each article, and that is especially rewarding to me. People can make or break something like this, and it only takes one. That’s just not the case here. Everybody is unique in their ways and abilities but we’re all strumming harmoniously to get the job done. I can honestly say this is the most enjoyable Textpattern project I’ve ever worked on, and the editorial team is to thank for that. Thank you, team. Unfortunately, those commitments I spoke of can sometimes be too great. I regret to say that Les Smith has had to pull out of action. That doesn’t mean he’s gone entirely, but “community managers”, by nature of the medium, are usually pretty visible and active, and Les just can’t be right now. So we’re looking to the community to help keep the various social channels pinging. The good news is that we gained two more people against the one departure, and possibly an occasional third. First is Philipp Schilling, who is now a full-fledged member of the editorial team and (in a manner of speaking) the Textpattern project’s first official Brand Manager by collaboration with editorial. 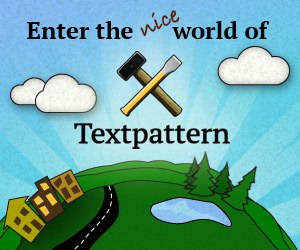 There’s no better person for the job, considering he’s the creator of the existing Textpattern logo. Philipp comes out of the gate with some exciting ideas about strengthening the Textpattern brand, and it’s very positive indeed. I’ll come back to Philipp’s proposal shortly. We’ve also regained the graphic phenomenon, Stephan Simonis, in official capacity. Stephan is now the magazine’s graphic designer, and he’s also delivered big right out of the gate, providing two new sets of Textpattern ad units for the magazine. The sets target two audience types, but I won’t bias what you think they may be. You’ll see the sets in rotation as you click around the site; one is a blue theme and the other is brown. We still have another set coming that should get the attention of yet a third audience type. Stephan would appreciate your comments about them. He’s in all of our social channels waiting to hear from you. Lastly, we have Sam Weiss as a technical editor on a case-by-case basis (i.e., time dependent). As we start publishing more full-length tutorials, such as the ace from Kevin Potts this issue, Building a Textpattern-powered public login form, we need one or two people (besides, Stef Dawson, the man who’s everywhere) with deep insight to Textpattern architecture who can review drafts when code and mechanics are involved. Sam is one person who may provide these quality checks. We’d like to have another, and maybe it’s you. This is a good time to remind readers the door is still open for a column editor or two who can produce copy (on rotation), and especially a CMS jockey that would like to lift the Showdown! column off the ground. That column is begging to be produced, and readers would stampede to it. Magazine politics—it wouldn’t be an editor’s column without them. I said I’d come back to Philipp’s work, and here it is. As Philipp talks about under the Tying the family together section of his excellent debut article, this magazine is not considered beholden to the same unified branding as he’s proposing for the other resource sites. As Editor-in-Chief of the magazine, I’d like to explain why. If you’re new to this conversation, here’s a little background. When we relaunched the magazine, we changed the logo by dropping “Mag” from the logotype. Let’s remember there was no logo mark, and there still isn’t. Effectively, the logo went from “TXP Mag” to just “TXP”. We made this decision for strategic marketing reasons, because it’s inarguable that Textpattern hasn’t exactly flourished in its time, and we want the magazine to help do something about it. The idea being that a shorter, snappier shop sign on the content marketing channel (what the magazine essentially is) would treat the genre fine and click with the nickname that people in the community already used unofficially—an endearing term, as it turns out. But we didn’t just pull the idea out of a black sack, we first took the cue to consider it from somebody who’s worked in publishing for the last 20 years and knows a thing or two about what works and what doesn’t, Les Smith (sad to see him go). We then followed that up by actually looking at what other web magazines are doing these days. What we found, as I’ve said before, is that many digital magazines do the same thing. Here’s just a few that you probably recognise: .net, Inc., A List Apart, Contents … and there’s more. The thing to note is that all of these publications are “legally” named .net Magazine, Inc. Magazine, A List Apart Magazine, and Contents Magazine. Look in the Terms of Service, the domain names, or sometimes just the copyright statements to see this is true. Yet none of them use a logotype that includes “Magazine” or any variation of it. What we’ve done with TXP Magazine is exactly the same thing. The magazine name hasn’t changed, it’s still TXP Magazine and we’ll keep on calling it that. This is clearly reflected in copy all over the site, including the business pages accessed from the footer. Only the logo has changed by dropping the “Mag” part out of it. Just like a lot of respected magazines do. Well, as I’ve explained already, there was a logical process (and a good reason) for making the change, and it complements the nickname. And being that we also follow the convention of other magazines and put “TXP Magazine” throughout magazine copy (case in point), I highly doubt any human being interested in this stuff will be confused. We’re willing to find out, and Philipp has provided us with a lovely new logo for the ride. I provide this context because detractors will no doubt see opportunity in Philipp’s article to revisit their campaign against the magazine logo, and that’s what I want to address now—why the magazine is not in Philipp’s unified branding as proposed. Again, the reason is strategic. Unlike the other sites in Philipp’s scope, which target and serve people who have already bought into Textpattern in one way or another and want or need resources in that context, the magazine’s primary targets (but not only, obviously) are people who have yet to discover Textpattern CMS. We’re confident—because of the planning and strategy we’re developing behind it—that magazine articles will be distributed and accessed more than any copy the project has ever produced before, and will reach a greater number of readers as a result. Magnitudes greater. Such readers won’t care about the logo, they’ll care about the information, and this magazine aims to dish it up good while it exists. What do readers see when they come to the magazine, besides great content? Assuming they aren’t using Readability or have ad blocking turned on—two things that Jeffrey Zeldman finds wholly unnecessary if web design is done right—they’ll see advertising, among other types of content typical to magazines, and like good web design, advertising can be done smart too. We know how sensitive advertising is for people, but this magazine needs it if it’s going to last, and it’s important to me that advertising is done elegantly with good user experience in mind. Our responsive advertising model goes a long way to help ensure this, and we’ll improve it as we discover more ways to do so. Thus I arrive at the point. Advertising is important in magazine brand consideration because we advertise Textpattern in the magazine, and that advertising already uses the Textpattern branding (logo mark and logotype). It should not be hard to visualise; if the magazine used a logo under the same uniform strategy as Philipp proposes, we’d be polluting the interface with too much Textpattern branding, and risk turning off both readers and potential advertisers. We’re simply not going to do that. There’s a time to wear the polo jersey with the insignia stitched on the breast, and there’s a time to don a suit and go do business. The resource sites should sport the jerseys and be familiar to existing customers (a common navigation and all that smart stuff). The magazine should be the genre it is (not a blog), true to magazine conventions, and get down to publishing business with a suit on. We’ll direct readers to everything that is good in the world, be it Textpattern CMS or anything else. As you may or may not know, we re-started the magazine with a quarterly publishing schedule in mind. Despite being a few days late this issue, we’re going to try and bump that up by aiming for a bimonthly schedule. But it’s just a goal; a highly optimistic goal. What it really means is from now on the magazine could be published anywhere from 2 to 3 months from the previous issue; never sooner and never later. Raising the bar even more, we’re going to aim for more articles per issue too, with a minimum of seven and an average goal of nine. Crazy, right? Maybe. But I think seven is at least doable every time, and there are strategic reasons to double-up on some column articles. For example, the Community Spotlight and Site Watch might get doubled-up on occasion since there are many interesting people to profile, and the Exhibit needs more showpieces to be helpful. The increase in articles also makes allowances for guest article contributions. We’ve not had any of these yet (we’re waiting for yours), but we anticipate getting them, and especially when the magazine is financially self-sustaining. Notable columns like Meaningful Labour and Hope for the Future are expected to be popular in this case and don’t require Textpattern fanaticism. In the near future, we’re going to start offering sponsored article opportunities to potential advertisers. If you’re not familiar with this concept, advertorials (what we’ll be calling “featured ads”) are essentially full articles published in the magazine and paid for (sponsored) by companies promoting a given product or service. One could frequently find these in .net Magazine, for example, though I haven’t noticed any there lately. Featured ads are quite different from ad unit advertising, as they are actual content that can’t be removed or blocked by technology. Because they are full articles (and thus more expensive), and because it behooves the sponsor to write excellent content for our readers (against our short list of requirements), you can expect the quality of the content to be good. Furthermore, featured ads will be filtered to target the same audiences defined for our responsive ad space, and be concerned with the same products and services as well. In other words, featured ads may very well be worth your time reading. More information about these will be written into the advertising section of the site, which will require a little restructuring when the time comes. Speaking of the Exhibit, I introduced the Exhibit last issue, and described it there in more detail, but the Exhibit is effectively a curated collection of websites that are built with Textpattern CMS. It’s meant to show prospective CMS seekers what Textpattern is capable of so they can make quick decisions as to whether Textpattern is right for their needs. And I really mean curated, because only the crème de la crème of Textpattern websites make it into the Exhibit. In case you’re wondering, the process begins here. Curating the Exhibit is not automated work. It takes time and effort to pick, evaluate (from a robust grid of criteria), and write-up every website we consider. That’s what curation is about, and it’s what will make the Exhibit stand apart from junk like this. Even the beloved We Love Textpattern is now more a link pool than anything else. Who’s actually going to wade through over 1,000 links? Certainly not the web manager tasked with quickly getting his company’s web project on track. So we bring you the Exhibit, which will not be hundreds of sites with as many redundant screenshots of what the sites themselves could show you, but a select collection of excellent sites; each accompanied by concise and informative details about why it’s worth considering. Our first Exhibit entry, and thus our first Site Watch write-up—24 Ways behind exhibit glass—is one many people will recognise, but is long past due for proper appreciation in this community’s ranks. Ralitza Dilovska took point on this one and spoke with Drew McLellan in depth about the site, the design and development of it, and the team that makes it hum. Important note: This first Site Watch article is not written in a format that future such articles will have. I mention this so people understand why the article structure will be different next time. We originally set out to profile Drew in Community Spotlight and do the Site Watch article on 24 Ways separately. For editorial reasons, we ended up combining the effort into a single Site Watch article, but we made the decision to do so after Drew had already been interviewed. His responses were too good to cut down to a section, so this article reads more like a profile than it does a site review against a list of criteria. 24 Ways will get an evaluation score like every site we consider for the Exhibit, it’s just work-in-progress. 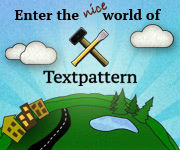 Get your propeller hats dusted and sharpen your paint brushes; the first major themes competition under Textpattern’s own flag is being conceived. Rumour has it that Textpattern 4.5 is coming out around August/September (that’s no hard date, but it has been mentioned), with Phil Wareham’s new frontend markup integrated, and quite a number of admin-side markup improvements too (don’t expect the kitchen sink). The anticipated release corresponds with TXP, Issue 3, in which we’ll have complete competition details, entry instructions, and so forth—or we’ll indicate where else you can find the information. But there’s a lot to work out between now and then if the competition is going to happen. I can’t go into every detail of planning, but there’s a few things I can say. The biggest issue at the moment is determining a platform. I don’t mean a new domain (we have those), but rather having a platform that makes sense. We first thought Textplates might be the ticket. That’s what it was used for once upon a time (and the domain is still just sitting there), but every attempt to touch base with someone there goes unanswered. The fresh content in—and increased traffic to—the themes site would no doubt be welcome by all. Between Philipp’s new branding initiative and this need for a competition platform, there’s something on the table to discuss. A chair is available for the steward of the Textgarden site, Stuart Butcher. Competition entry fees (no idea how much yet). Original (custom) themes only; no ports. A short list of guides and requirements. Plenty of time to create (heck, start now). A judging panel to scrutinize your efforts. Sponsors (if we can woo them). Grand announcement of winners in magazine; first issue in 2013. Your design dope showcased in the themes site. We’ve decided to remove all social media buttons and widgets that are tied to third-party scripts, specifically the social buttons at bottom of articles and the Google+ widget in the side-column. Our social icons in the side-column will remain, but with regular HTML links underneath them. This doesn’t mean we don’t believe in the power of social media or sharing, we’re simply doing it because after reading The growing epidemic of page bloat and the Drop social media buttons call, we’re fully convinced the third-party scripts don’t offer anything useful against the extra drag they put on site performance. We won’t be getting rid of every third-party tool, however; some do have more practical use, including DISQUS for our comments and the EmbedTweet script for displaying tweets in body copy. And that wraps up this episode of From the Editor. If you haven’t already done so, read the other articles in this issue… they are excellent. Please join me next time for more exciting news and surprises on this channel.